The initial concept for our Really Useful Boxes came from our owner who, as an accountant at a plastics company, wanted a transparent, strong, stacking storage box to store his archive records. After exhaustive searches he was unable to locate such a product so in good old-fashion tradition created it himself. 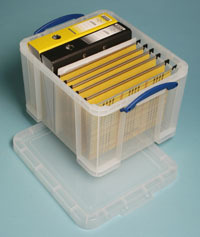 We have now evolved this concept into archival storage for CDs, VHS tapes, DVDs and LPs. We can now proudly claim to have the World's largest range of transparent, strong, stacking storage boxes. 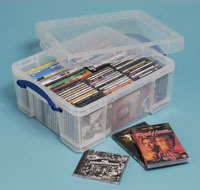 We were established in 1999 to develop a range of innovative plastic storage boxes. As far as we can understand it was the first time that a plastic storage box was created from a user's viewpoint. We had no previous container experience. The product does contain a great deal of original thought and we have a European and USA patent. Most people that see our product are impressed by both its simplicity and ability to live up to its name of Really Useful Box. The concept is one of those obvious products that should have been available years ago. From 1999 it took a year before we had a repeatable product that passed our vigorous quality requirements. We were fortunate that this coincided with both Staples UK and Makro UK committing to initial promotional trials. We subsequently introduced new sizes and new related products. These new products have been customer driven. We have now significantly expanded our customer base and presence in other countries, including the USA. Widest range of quality boxes, designed for specific applications at affordable prices. We will continue to develop our range of products and geographic markets, and currently have a number of additional new ideas that are being developed and tooled. Creation and successful marketing of a wide range of quality products that offer real customer benefits at affordable prices. This is to be achieved through the utilisation of modern management practices and by embracing technology. Customer satisfaction is our overriding aim. We are a customer driven organisation.